Union troops gathered around Washington D.C. in hope of seizing Manassas, VA, which was a vital railroad, but the Confederate troops aligned the creek waiting for Union forces at Bull Run. This was the first large battle of the war. The Confederate forces defeated the Union. General McClellan was in command of Union Army. He decided to approach Richmond from the Atlantic coast. McClellan landed troops in Yorktown, which is a peninsula between the York and James River, east of Richmond. There were battles fought there throughout July of 1862. The Confederates defeated the Union in the battles, led by General Joseph E. Johnston, then General Robert E. Lee. General Lee, commander of the Northern Virginia Army, moved to strike Union territory in Maryland. A Confederate messenger dropped a copy of the battle plans, which was found by a Union soldier. The Union then learned that Lee's forces were divided, so General Grant attacked. Antietam (Sharpsburg) was a day long battle on September 17, 1862 at Antietam Creek in Maryland. The battle ended in a draw. This battle was the first after the Union dispersed troops into the West, as well as the East. The Battle of Shiloh was fought as one of the battles of the "War in the West." General Grant led his army into Tennessee and continued to advance. 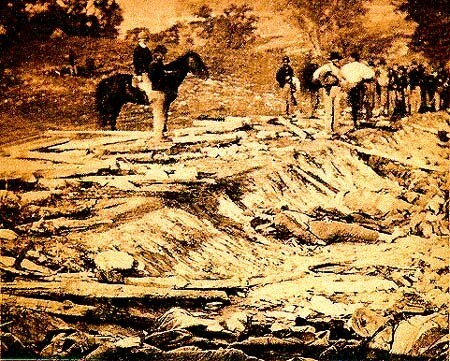 Confederate forces attacked near Shiloh, resulting in thousands of casualties between both armies in two days of fighting. The Union won the bloodiest battle of the Civil War, even though they suffered more losses than the Confederates. The South won the Battle of Chancellorville, part of the rising hope in the South. This was a time for hope in the South because the Union was loosing troops. Stonewall Jackson was killed accidentally by one of his own men at Chancellorville when mistaken for a Yankee. 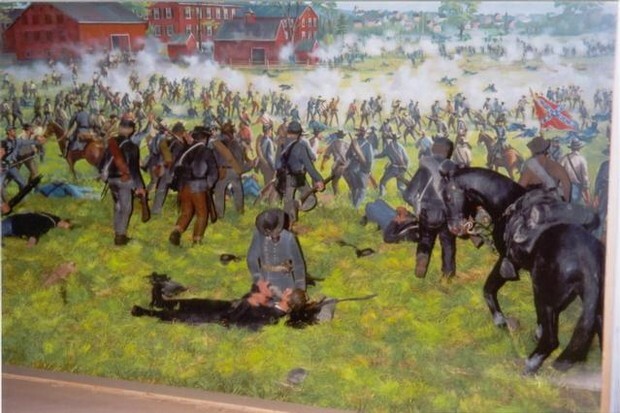 Almost accidentally, Confederate troops discovered Union calvary in Gettysburg, Pennsylvania. The Confederates attacked, paving the way for the largest battle of the war, lasting three days. 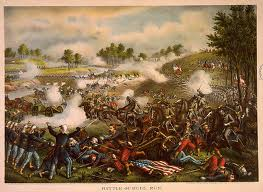 The Union Army won the Battle of Gettysburg, destroying Lee's hopes of carrying the fighting further up North. General Sherman took command of the Union Army during the Fall of Atlanta. 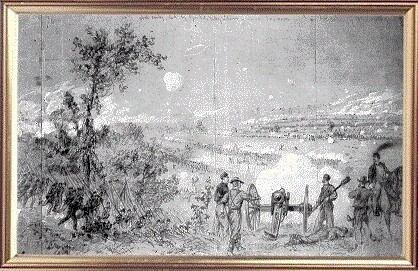 Sherman led troops through Georgia, seizing and burning Atlanta, a vital city and railroad junction, on September 2, 1864. General Sherman scorched the towns he marched through on his way towards the Atlantic coast and up to Virginia. His army followed the "scorched earth policy," beginning first with Atlanta. They would burn, tear up railroad tracks, raided and burned homes, and captured livestock; Ruthless destruction. Union Army forces Confederate Army out of the Atlantic port of Savannah, GA on December 22, 1864. Sherman continued his burning through North Carolina with hopes of reaching Virginia. 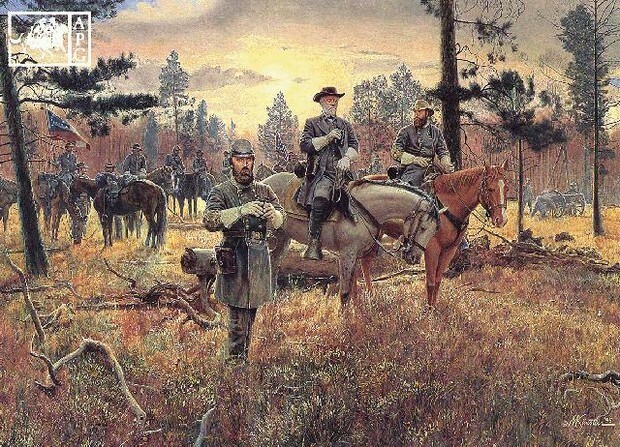 But, General Lee attempted to halt the Union Army and break through Grant's lines in Petersburg, VA. 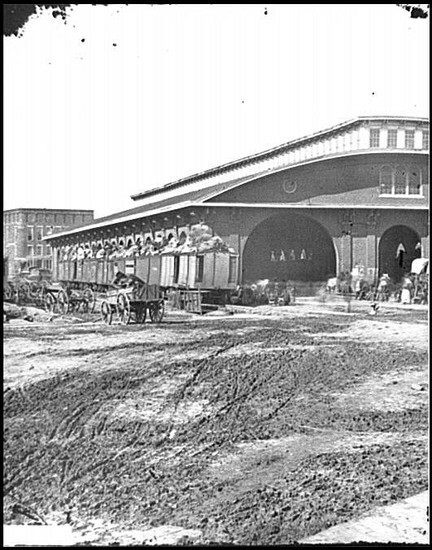 The Union seized Petersburg on April 2, 1865 and then Richmond on the next day. Union forces cut Lee off from leading his remaining army to North Carolina. On April 9, 1865, General Lee surrendered to Grant waving the white flag atop a hill overlooking the Appomattox River in Virginia. General Grant later accepted General Lee's surrender in the Appomattox Court House.